Exhausted and now late for a wedding, I was ready to let the airline have it. So I did what many do when frustrated with a company’s service; I took my gripe to Twitter and aired my grievances to the world in 140 characters or less. In retrospect, I admit it sounds like a little much, but the reality is, I’m not alone. 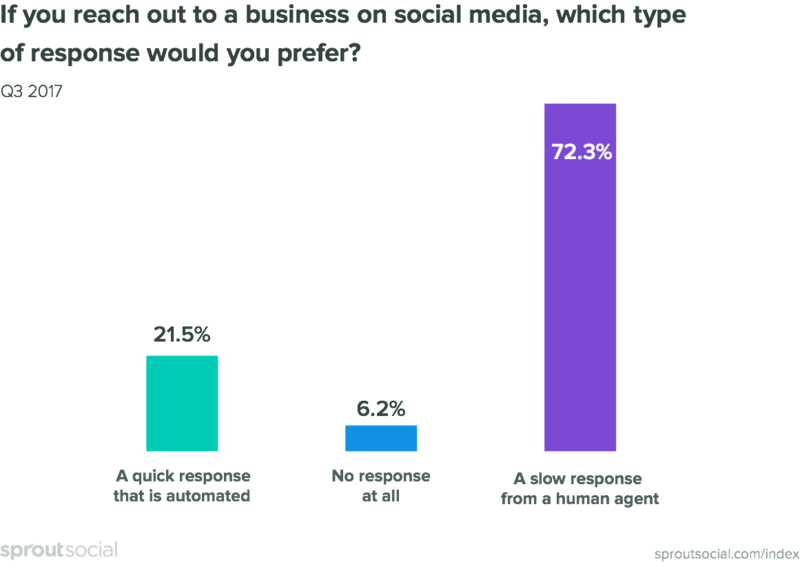 Sprout’s Q3 2017 Index found that a whopping 46% of people have used social media to “call out” a business or complain. It brings me a glimmer of relief to know that there aren’t just others like me, but there are many others like me who can’t resist the urge to call out brands on social. But what pushes us to the point of complaining? And what do we expect out of it? 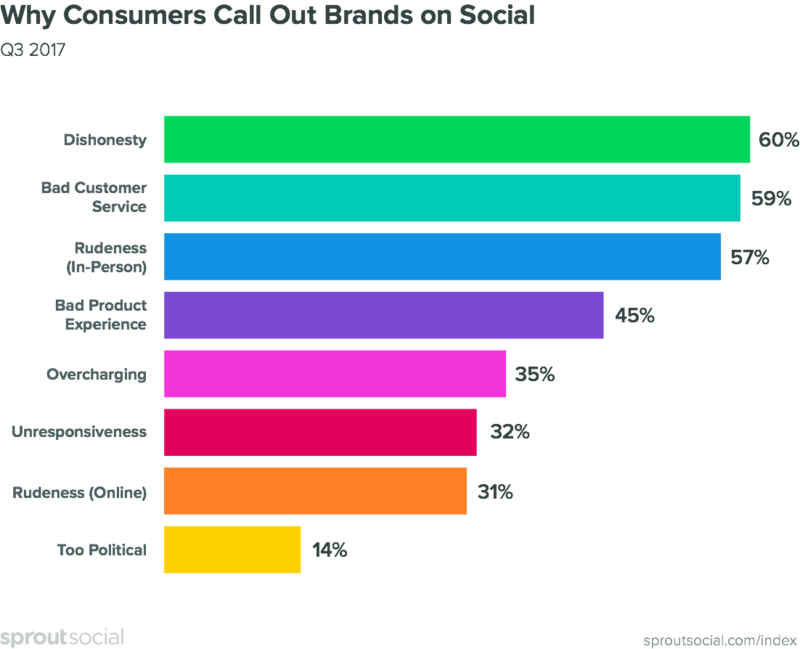 Our Index data shows that the top factor motivating people to call out a brand on social is dishonesty, followed closely by bad customer service and in-person rudeness. It’s no wonder, then, that my airline complaint probably isn’t the first time you’ve heard of someone taking to Twitter to share their not-so-pleasant flight experience. Now that we understand why people do it, the question is what can brands do about it? What’s the best thing an organization can do to assuage social complaints? Fortunately, the answer is simple: respond. The data shows that when people complain, nearly 94% expect to hear back from you. So if you want to lower blood-pressure and instill good vibes, do yourself a favor and craft a quick response. If you do this right, there’s even a chance to win back business; 37% of complainers say they’d buy again if they’re pleased with your response. The big takeaway here is in today’s culture of consumer call-outs, it’s critical for brands to be attentive to social conversations and responsive when their audience initiates conversation. Your audience wants to hear from you. Make sure you’re paying attention. For more insight into today’s consumer call-out culture (and how your brand can keep it cool when issues arise online) tune in to our webinar: How Brands Can Thrive When Consumers Complain. Hope to see you there!